But the raw data point in the opposite direction: people reported to enjoy thinking. Five studies had means below the midpoint, four had means above it. Because the paper’s inferences are about enjoyment I now focus on the question that directly measured enjoyment. It read “how much did you enjoy sitting in the room and thinking?” 1 = “not at all enjoyable” to 5 = “somewhat enjoyable” to 9 = “extremely enjoyable”. That’s it. 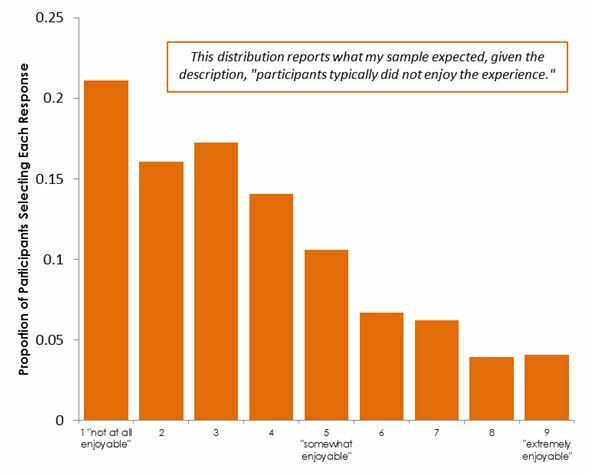 OK, so what sort of pattern would you expect after reading “participants typically did not enjoy spending 6 to 15 minutes in a room by themselves with nothing to do but think.”? 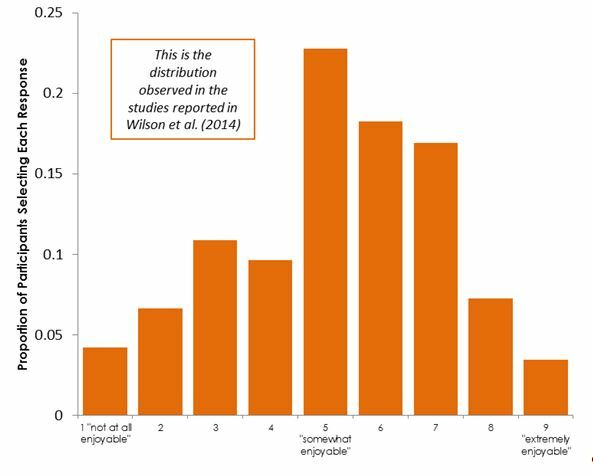 If I were trying out a new manipulation and wanted to ensure that participants typically DID enjoy it, I would be satisfied with the distribution above. I would infer people typically enjoy being alone in a room with nothing to do but think. The thing is, though that inference is rather directly in opposition to the authors’, it is not any less interesting. In fact, it highlights value in manipulations they mostly gloss over. In those initial studies, the authors try a number of manipulations which compare the basic control condition to one in which people were directed to fantasize during the thinking period. Despite strong and forceful manipulations (e.g., Participants chose and wrote about the details of activities that would be fun to think about, and then were told to spend the thinking period considering either those activities, or if they wanted, something that was more pleasant or entertaining), there were never any significant differences. People in the control condition enjoyed the experience just as much as the fantasy conditions. People already know how to enjoy their thoughts. Instructing them how to fantasize does not help. Finally, if readers think that the electric shock finding is interesting conditional on the (I think, erroneous) belief that it is not enjoyable to be alone in thought, then the finding is surely even more interesting if we instead take the data at face value: Some people choose to self-administer an electric shock despite enjoying sitting alone with their thoughts. Our policy at DataColada is to give drafts of our post to authors whose work we cover before posting, asking for feedback and providing an opportunity to comment. Tim Wilson was very responsive in providing feedback and suggesting changes to previous drafts. Furthermore, he offered the response below. We thank Professor Nelson for his interest in our work and for offering to post a response. Needless to say we disagree with Prof. Nelson’s characterization of our results, but because it took us a bit more than the allotted 150 words to explain why, we have posted our reply here.